Good. I hope it's right; this is the kind of comeback nVidia needs to stay afloat and remain competitive. Someone explain to me why a company with more then half the marketshare, a mobile product blowing away competition, and the majority of the intel pairing money has any issue "staying afloat"? Come on, we all know Fermi was a gigantic success and we all know AMD got spanked last time. This is more then likely getting discussed to simply get Nvidia in the news and have thier "fans" hold off for a few months instead of buying the 7970/50. Either way, and this is coming from an AMD mind you, I wholly expect Nvidia to do the exact same thing they did with Fermi. That being said, next time around there won't be the 28nm issues, 25% leakage and so forth stopping the GCN architecture from actually getting out in front. The 7970s have a massive ability to OC and it is getting people in a frenzy to buy the OC and modified editions. Nvidia has nothing to worry about, don't worry, the lime green machines aren't going anywhere soon, not with EVERYONE buying their stuff and everyone whining about AMD drivers (when it isn't the driver, it's the software support in the driver, the CCC always works FINE!). What is interesting is that GK104 seems to be the evolution of GF104, and if GK104 cards will have the price of GF104 cards and the performance will be above that of the GF110 cards, we'll see a huge market upset in April. Charlie even hints that it will be even better then an HD7970? I mean, really, Charlie said that? GK104 must be frickin' awesome for Charlie to say such a thing in an nVidia "vs." article. Also, in other news, Hell has frozen over. All of a sudden, selling that GF110 inventory as a "special edition" GTX560 Ti "448 cores" makes a hell of a lot more sense. 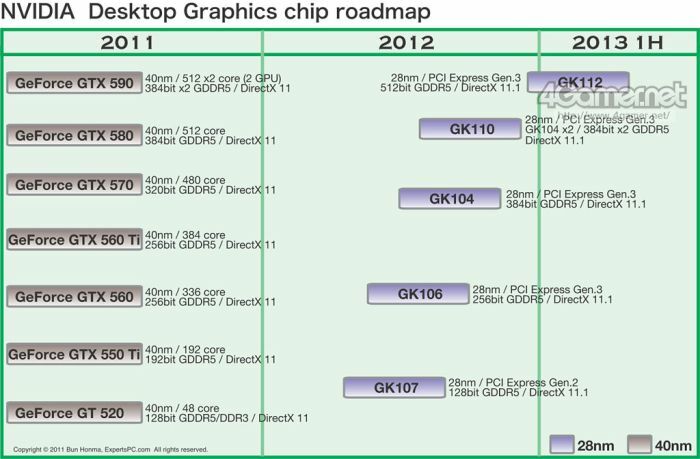 All that struggle with GF100, designing a big fat hot chip on 40nm in 2010 seems to be paying dividents on 28nm in 2012. GK104 isn't my worry, it's the GK110/112 releases. It appears to be a 2xGK104 card based on the 384-bit x2 marking, but more then likely they will refresh the line when it happens.